This is very tasty, spicy peppery recipe. In Malabar region people love to take this with plain rice though it can go well with Porotta or Chappatti. =►Heat 3tsp of oil in a pan and add chopped onion into it. 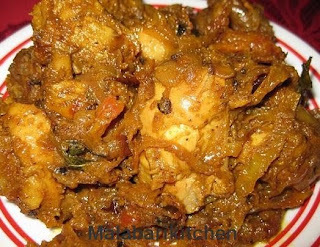 =►Once it is half fried add grated ginger & garlic into it and keep on stirring. =►Stir it till the raw smell of garlic goes off. =►Next add all spices and sauté it well for 30sec on sim flame. =►Add tomato along with liver into it and add salt for taste (no need to add any water). =►Mix it properly and let it cook in sim flme for 15-20min. =►Close it with a lid so that vapors stay in it and water automatically comes. =►Mix it well after opening the lid .Make it to a medium flame. =►Keep on stirring it for another 15 min. Now it is ready for frying. 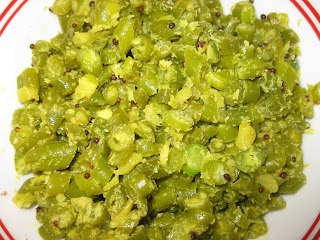 =►Heat 4tsp of oil in a pan add mustard seeds and allow it to splutter. 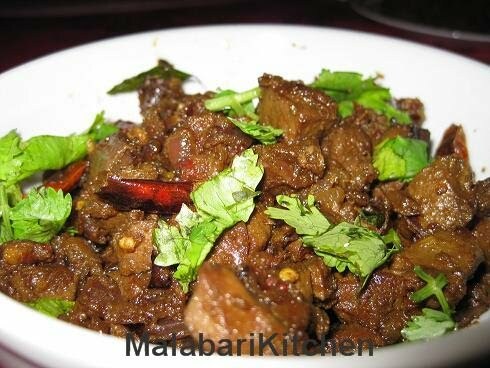 =►Add dry red chilly, curry leaves and shallots into it and fry it. on medium flame for 10-15mins.